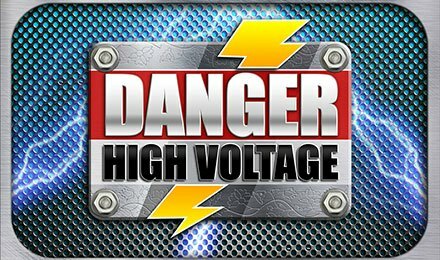 Danger High Voltage slot is themed on the song Danger High Voltage by American Rock Band, Electric Six. This slot game is a 6 reel and 4,096 ways to win machine from Big Time Gaming. Look out for rewarding bonus rounds, that award great wins and multipliers of up to 66x your stake! On the well-designed setting, symbols that come into play are; glitter balls, tacos, bells, skulls, hearts and low value cards. To win on Danger High Voltage slot, create winning combinations by landing the same symbols on adjacent reels. In total, there are 4,096 ways to win, where the highest payouts come out through the bonus features of the game! Amount of Paylines Selection: All win lines are fixed and cannot be altered. Coin Values: Coin values range from the lowest amount of £0.20, £0.40, £1.00, £3.00, £5.00 and £10.00. The WILD on Danger High Voltage slot replaces all symbols bar the scatter symbol. The bonus scatter symbol is the Desire Heart, which triggers a bonus round when three or more of them land anywhere in view. Trigger this feature and receive 15 free spins to play. Also, full wild reels and multipliers boost pays up to 66x your bet. The feature can be retriggered, with an unlimited amount of free spins on offer. When the feature is triggered, 7 free spins are awarded. Watch out for the symbol reel, which will choose one symbol, and will become sticky wilds throughout the free spins feature. Retrigger up to 19 free spins. Now you can enjoy amazing rock oldies at Moon Games Casino! Launch the game on your mobile, desktop or tablet, and pocket massive wins on triggered bonus rounds and features!